- Make sure to solder pin headers. - Before start making the project, be sure your Raspberry Pi Zero Wireless is fully operational. By fully operational, I mean: micro-SD card with Rapsbian installed, wi-fi Internet connectivity working properly and local access or remote access established. 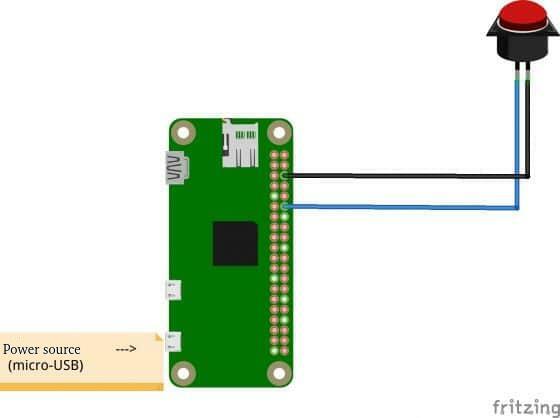 This project shows how to build a "smart emergency button," which sends a Pushbullet notification to pre-determined devices anywhere in world when pressed. This project uses as main board a Raspberry Pi Zero Wireless, a great board for prototyping small, powerfull and Internet of Things projects. The motivation for making this project came from a story told me by a friend (Douglas Vieira), in fact a sad story. Douglas has told me that one of his relatives had a serious illness, and was alone in a day that has collapsed. Douglas' relative wasn't familiar with technology and had some difficulties to use cellphones/smartphones, what made the situation worse: help couldn't be called. Unfortunately, Douglas' relative has been found some hours after collapse only, and even going to hospital / emergency hasn't survived. Douglas told me that if his relative had a device really easy-to-use to call for help, maybe had a chance to survive. Also, considering that another one of Douglas' family members are in similar condition (serious illness and/or elderly people), the idea of a emergency device made more sense. This project must be as easy-to-use as possible, able to trigger a emergency alert in a button-press event. Plus, it must have Internet connectivity, as long as the people who receive the alert can be located everywhere in the emergency trigger moment. Also, the project should allow improvements for future requirements (i.e. more emergency triggers, more possibilities of notifying people who can help, etc.). Considering this requirements, Raspbery Pi Zero Wireless fits well. This board has built-in wi-fi connectivity, powerful computational resources for an embedded device (powerful processing, good RAM memory amount and a bunch of GPIOs), small size (comparing to another popular Single-Board Computers available), can run Linux OS (a very reliable and powerful operational system, what allows great future improvements on project) and, last but not least, has a very competitive cost. - The project program will check continuously a GPIO that has a button connected to. As this button is pressed, a notification is sent to whom must receive the emergency alert. - Also, after sending the notification, the project program waits for the button release, to ensure only one emergency alert is sent per button press. - Last, the notification send/receive platform must be defined. For this, this project uses Pushbullet (https://www.pushbullet.com/), a free push notification system that has clients for smartphones and tablets and very well documented APIs, allowing send notification from many ways. Getting deeper into project development itself, it's time to setup the hardware for the project. The hardware for this project includes:- Raspberry Pi Zero W. You will need to solder pin headers in it- A round arcade button (hole: 34mm)- Two male/female jumpers- A 5V micro-USB power source (I would like to recommend a 5V/2A power source). Once you've got all the hardware parts required, put them all together according to project schematics (located in Schematics section of this post). IMPORTANT: when wiring the round arcade button, NO (Normally Open) contact must be used. Otherwise, this project won't work as it is. 1. Go to the app stores of your devices (devices that must receive the emergency alert/notification sent by this project) and install Pushbullet app. 2. In one of the devices you installed Pushbullet app, open it and create your free account (it's pretty easy to do, and you can use your social networks to register your account if you want to). 3. Now, from a computer access Pushbullet website (https://www.pushbullet.com/) and log with account created in step 2. 4. Once logged in, click on "Settings", then "Account" and then in "Create Access Token" button (as shown in picture below). 5. Your Access Token will be revealed. Copy it and save in a safe place (you will need this Access Token further on this project). The project program / script is available in source-code section of this post. It's written in Python programming language, in order to make it simple to read, understand and future improvements. In nano text editor, paste the source-code, replace access_token variable content with you Pushbullet Access Token and exit and save. sudo crontab -eAnd adding a the following line to it. @reboot sudo python /home/pi/Python/emergency_button_notify.py &After add the line, exit and save and reboot Raspberry Pi using command below. sudo rebootAfter reboot, just press the button and see the notification popping-up in the devices logged with your account in Pushbullet. After reboot, just press the button and see the notification popping-up in the devices logged with your account in Pushbullet. This is the project repository. It includes source-code and enclosure/case (stl files). StringMsg = "Emergency button pressing #"+str(number)+". Last date/time emergency button has been pressed: "+StringDataHora+"." #if emergency button is pressed, a Pushbullet notification is sent. #waits for emergency button release. # This ensures no risk of sending multiple notifications in just one button press.